ISLAMABAD — Afghanistan’s President Ashraf Ghani has put a peace offer on the table, and analysts say the ball is now in the Taliban’s court. But so far the militants are showing no sign of being interested. Ghani’s offer calls for unconditional talks accompanied by a cease-fire, recognition of the Taliban as a political party, an office in Kabul and the release of some prisoners. Ghani said he would also try to get Taliban leaders removed from international terrorist lists, as well as provide them with passports to allow them to travel freely. The Taliban, who have long demanded to talk directly to the United States before the Kabul government, replied with silence. Early indications are not promising. U.S. Ambassador Nikki Haley said Wednesday that the Trump administration’s policy in Afghanistan is working, saying talks between the government and Taliban extremists, and a peace process, are closer than ever before. Over the weekend, the Taliban issued a rambling English- language statement urging Islamic clerics to boycott a gathering later this month in Indonesia, where religious leaders from Pakistan, Afghanistan and Indonesia are to meet to see if they can offer a path to peace in Afghanistan. The conference in Bogar in Indonesia’s West Java is organized by the Indonesian Ulema Council, an association of clerics, but with official Afghan support. Another discouraging sign came from a Taliban official familiar with his movement’s stand on Ghani’s offer. He criticized it, telling The Associated Press that it did not address Taliban demands for the withdrawal of international forces from Afghanistan nor the implementation of an Islamic system. Many in Afghanistan and elsewhere, particularly women’s rights activists, are fearful of the Taliban’s hard-line interpretation of an Islamic system and deeply oppose giving the group any room to implement it. During Taliban rule, which ended with the U.S.-led invasion in 2001, girls were denied education and women access to jobs. Men were forced to wear beards, and music and television were outlawed. Since their ouster, the Taliban have issued several statements saying they would allow girls to go to school — but under strict Islamic guidelines — and let women work — but segregated from male colleagues. They have not committed to women in leadership roles or to their equal participation with Afghan men. The Taliban official said the aim of his movement’s war is two-fold — “to end the invasion and enforce an Islamic system. Has Ashraf Ghani talked about this? It seems Ghani does not want peace and is just joking.” The official spoke on condition of anonymity to discuss the Taliban position. Still, Ghani’s peace offer has met with widespread approval. Though the president has repeatedly urged the Taliban to embrace peace talks, this was the first time he lay out a set of offers. Even neighbor Pakistan, who has been sharply criticized by Afghanistan and the United States for harboring Taliban on their soil, has lauded Ghani’s offer. But analysts caution that many details are left uncertain, such as who would stop fighting first. And there are major unknowns external to the proposal itself. Can Ghani heal a deepening crisis within his own profoundly divided government enough to present a united front at the negotiation table? And the elephant in the room: Is the United States seeking a more permanent presence in Afghanistan? A negotiated peace is widely seen as the only way to end Afghanistan’s war, which is now in its 17th year and caused the deaths of tens of thousands of civilians. Over the years, it has cost the United States alone more than $122 billion. Wilder will be among dozens of Afghan watchers attending this week’s conference on Afghanistan at the Peace Research Institute Oslo (PRIO) in the Norwegian capital beginning on Tuesday. In 2015 Oslo brokered previous talks with the Taliban. The Taliban have been consistent in their demand for talks with the United States before talking to the Afghan government. Washington has been equally insistent in its official stance refusing to talk directly to the Taliban, though it has held secret talks in the past. 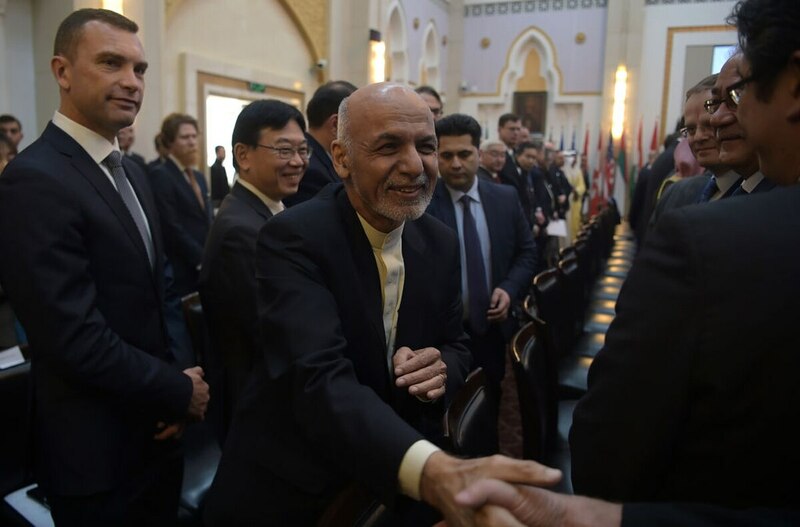 Ruttig also pointed out that the final declaration that came out of last month’s Kabul conference that produced Ghani’s peace offering promised that future talks could involve “contested aspects of the future international presence” in Afghanistan. Ruttig said that could provide an opening for direct or indirect talks between the U.S. and the Taliban. Michael Kugelman, Asia Program deputy director at the Washington-based Woodrow Wilson Center, said there is also no legal obstacle to U.S. talks with the Taliban because until now Washington has not declared the group a terrorist organization.